Left dock at sunrise with one passenger and goal of getting some tiles and a snowy. Headed straight for the humps to get some fresh bait. Stopped 2 miles short on some weeds and caught 6 mahi, 2 were keepers. Back south again looking for birds and only 3-4 boats at the hump. We trolled around and picked up 4 BFT – one a fatty. We hooked up on several including double and triple hook ups but the sharks, pulled hooks and flipper only left us with 4. Never got any skippies or Bonitos. Turn around towards the north and throttles down – off to bottom grounds. On the way we come across some nice weeds so we troll it for a while and get a double and triple hook-up but all were small. They never had any friends following them to the boat. Back on course and around 700 we set up for tile and a snowy. We make 9 passes and get our limit of 6 Tiles, no snowy. We are still happy as this was the first time catching tile for both of us. One was 24”, two at 22” other 3 smaller but they tasted great. 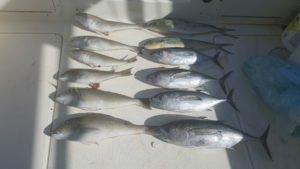 Another great day fishing in the Florida Keys.